Castle Point, NY: Cub Scout Pack 56, today, delivered non-perishable food items to the Castle Point Veterans Administration Hospital Food Pantry, collected as part of BSA's National Scouting for Food Campaign. Approximately 3500 pounds, or nearly 4500 items were delivered early Sunday morning by Pack 56's Cub Scouts and adult volunteers to the Castle Point facility and received the Food Pantry Coordinator, Steve Cecere. The Cub Scouts were given an overview of the food pantry's operations and how the VA food pantry distributes food to veterans in need. Steve Cecere informed members of Pack 56 that the food pantry currently assists approximately 140 veterans and their families. Steve Cecere stated, "It is through your time and generosity and that of so many who generously donated food that the food pantry can provide help to those less fortunate." Steve informed Pack 56's cubs and leaders that it is during this time of year when there is a great need for donations. La Grange, NY: It was a mild day in January as the Pack 56 first- and second-year Webelos participated in the BSA Hudson Valley Council, Dutchess District 48th annual Eskimo Run taking place at James Baird State Park. With no snow on the ground, the boys pulled their sleds over the approximately mile and a half course, stopping at eleven stations to demonstrate their scouting skills and knowledge. Both patrols, the Howlers and Gamecocks, exhibited great scout spirit as they navigated the course. Their patrol cheers and chants could be heard throughout the park. Both patrols performed particularly well. Pack 56’s first-year Webelos, the Howler Patrol, completed the Blue Trail and finished in second place overall. The Gamecock Patrol, Pack 56’s second-year Webelos won first place for the Gold Trail, having been the 2016 Blue Trail first place winners and making them back-to-back winners. “Pack 56’s leaders couldn’t be more proud of both patrols and their accomplishments. Their hard work, dedication, and team spirit demonstrated that they live by the Scout Oath, Law, and Moto, ‘Be Prepared’. 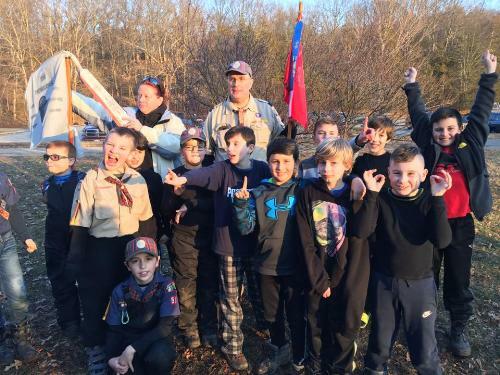 They are an inspiration to Pack 56’s younger cub scouts.” said Nicole Parisi, Pack 56’s Cubmaster, when she received the news after the awards were presented.